Customize your perfect Sundance Spa, from just $29 a week. Sign-up to use Aqua-Tech's FREE interactive online Hot Tub Selector, and instantly discover the best hot tub options for you—simply by telling us your preferred features! 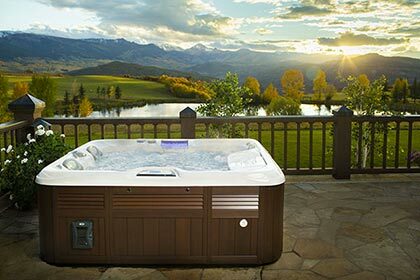 Sundance Spas offers four series of exceptional quality hot tubs to cater to all styles and budgets. There is a tub for every home, every yard—everybody! All models of tubs are customizable, right down to to your choice of acrylic colour, exterior panel colour, stereo equipment and beyond. You can select from a huge range of features including the type of jets you’d like, the kind of massage you’re interested in, the number of seats available and the style of lighting. The Select Series is a stunning option for environmentally-minded consumers looking for an energy efficient model that doesn’t forgo any of the quality or pleasure you’d expect from a Sundance Spa. The 880 Series defines what indulgence means in the hot tub industry. The beautiful design couples easily with the advanced technology to give you an unexcelled experience in the comfort of your own home. The 780 Series is a great mix of fun and relaxation. Designed to maximize space for entertaining without compromising on the therapeutic benefits, this series comfortably ranges in size from 2 to 7 people. The 680 Series offers excellent quality at an unbeatable price, allowing for numerous modifications. This series comes in a variety of shapes and sizes making it a great option for properties with space restrictions. Our friendly team is looking forward to helping you turn your backyard into the inviting and relaxing space you’ve always wanted! Request a FREE Home Visit and Backyard Assessment! If you're not sure about which Sundance Spas hot tub will be best for you, request your FREE in-home consultation. Aqua-Tech's experts will help you find the perfect Sundance Spa model!